This is the standard 88 seat intermediate IEP vehicle. As I predicted, the seats will be crammed in, and mostly in the unidirectional arrangement. A Swedish survey showed is preferred only by about 30% of passengers. Many of the so-called window seats will not be window seats, including those in the facing bays, which are perfectly placed with a solid panel directly in people's line of vision. That adds up to an unsatisfactory travel experience for a lot of people. There is only one toilet for all this crowd. Note too, the shortage of luggage space - by the exit, where people will not be able to supervise it. Aren't we constantly being reminded to keep our luggage with us at all times? There was a notorious case when a thief who exploited the possibilities discovered that the suitcase he had stolen contained an IRA bomb. Only a few months ago, a couple of men were convicted of theft of passengers' luggage. Yet the problem is still not addressed, and this on trains which could be in service towards the end of the century. Yet again, the designers have got it all exactly wrong. Pity the poor passengers. So what is the right way to design a railway carriage? First of all, work out what the length should be, bearing in mind that the longer it is, the narrower it has to be. The widest permissible width on Britain's railways is around 2.8 metres, a full 20 cm less than the width of trains in many parts of Europe. That cannot be helped, but it does mean that the vehicles should not be stretched unduly. 20 metres gives all the permissible width, the 23 metre mark 3 stock loses about 7 cm, and it gets progressively worse after that. The 25 metre IEP vehicles will actually be 2.75 metres wide, slightly more than mark 3 but either that means route restrictions, or a lot of money to be spent on gauge enhancement, or that a new method has been used to calculate loading gauge tolerances. Whichever is the case, this is almost certainly not an optimum length, that being probably around 22 metres. Having decided the length, the next task is to work out the bay dimension. 2 metres is desirable and that is the standard on trains like the Danish IC3. 1.8 metre bays are good enough for commuter trains such as the Electrostar but otherwise is on the tight side. Mark 1 stock had 1.93 metre bays but a lot of space was taken up by traditional upholstered cushioning. Mark 2 stock had 1.95 metre bays which was generous, especially with the thinner type of upholstery with ergonomic seating that was fitted to them. Class 180 Adelante stock has 1.90 metre bays and it is generally agreed that these are amongst the best recent inter-city designs to appear in Britain. Having decided the bay dimension, there are no further decisions to be made. The majority of seats should be in a facing bay arrangement with a table. Nor should there be any need to change the seating layout throughout the lifetime of the vehicle. The only distinction between first class and standard class should be 2+2 seating in the standard class and 2+1 in first, though a few side-corridor coaches would probably be appreciated both by first class passengers and standard class passengers travelling in family groups. That way, the families can sit together and their children are not going to disturb anyone. There are two important benefits in this seating layout. The first is that it creates space between seat back, where people can keep their cases in sight throughout their journey. The second benefit is that if seats are arranged in facing bays, each pair of back-to-back seats can be designed as a structural unit. This avoids having to provide individual seats with heavy, crashworthy frames. With several dozen of them in a vehicle, the build-up in weight is considerable. This was discovered when the lightweight British Rail seats were replaced by new ones in a fleet of 1970s suburban EMUs, which then had difficulty in keeping time to the previous scheduled as the units became under-powered. ..so let's check if I've got this right, you want trains to be as wide as possible, but don't want a new line which would be able to take the wider trains which would be possible on HS2. You want trains to have lots of seating space, but not the infrastructure to allow the existing lines to be able to have the capacity to allow trains not to be so heavily loaded to allow this. "A Swedish survey showed is preferred only by about 30% of passengers." However in the UK 100% of people in the UK would rather have any seat rather than having to stand, which would be the result if our trains didn't have the capacity of IEP's - unless your design can fit 600 seats into a train of 260m in length. Anonymous - interesting points but there are a number of excluded middles in your argument. 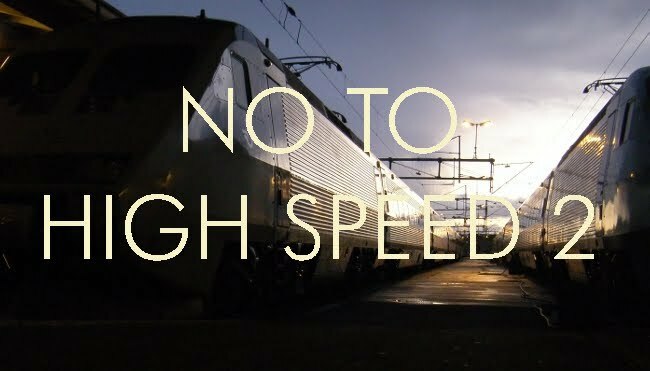 HS2 will only be able to take wider trains when the entire journey can be made on it. Which will not be beyond Birmingham for another 20 years. There are, as explained at length in other postings in this blog, many other possible ways of providing extra capacity than by constructing HS2. Where does your 260m limit come from. If you look at old photographs the trains on the WCML and ECML run to 17 x 20 metre vehicles, which is about 350 metres long, so what happened to reduce the space. Paddington lost platform length when the bufferstops were moved, if I recall the same happened at King's Cross, so presumably it can be reinstated, especially now that the latter station has its new concourse on the west side of the platforms. A 23 metre vehicle has the potential for 9 bays, ie places of passengers and their luggage, all in facing configuration. A few more can be fitted in if some of the seats are in airline configuration, say 76 or possibly 80, though the latter would be a squeeze. There would be less empty seating if the vehicles were of a standard layout and could be designated first or standard class according to demand. But when the seats are crammed, it makes them unacceptable to first class passengers. Given that to Birmingham isn't going to be able to run trains for 13 of those 20 years its not as much of a problem as you imply. Also, although there are other ways of increasing capacity, it could be possible that some of those maybe needed to keep the network going depending on passenger numbers between now and the opening of HS2. The limit of 260m is so that the comparison is like for like (i.e. comparing an IEP of 10 coaches made up of 2x5 coach sets with your configuration - note how I'm giving you 4 lots of end coaches with your comparison so as to give you the best chance to get the maximum number of seats in as you'll also need to fit in 4 extra doors) if longer trains were viable then it could be possible to lengthen the length of the IEP's and so therefore increase their capacity, which would then mean that you would have to provide more seats in your design. If only we could have Japanese style seating where the seats can be rotated to always face direction of travel. Works very well on Shinkansen trains. I thoroughly enjoyed reading this, both as a railway enthusiast and keen designer. I am currently sitting in a GWR mk 3, travelling past Slough at near 125 mph and I just had the thought: Could GWR just upgrade their 125s by swapping the class 43s for a more powerful bi mode loco which is compatible with their mark 3 HST stock? I would have thought its more cost effective to refurb their mark 3 stock with pneumatic plug doors and order new locos (like Chiltern/Wrex & Shrop did) than to buy whole new IEP sets, or maybe I'm wrong - I would very much like to hear what other people think. Kind Regards.